Security Pest Elimination is one of the most respected termite control & termite inspection companies in Massachusetts. We provide termite pest inspection reports and free termite control quotes for Massachusetts and Southern NH customers. Our termite treatments provide fast complete termite extermination from your home and carry one of the longest termite warranties in the business. The best termite treatments today for complete termite extermination use an odorless, non-repellant, low toxicity liquid that termites can’t detect (unlike the older type liquids that were repellant and termites could circumvent). It is applied to the soil, next to your exterior foundation, all the way around your house. Think of it as a liquid baiting system, but with this type of treatment you don’t have to wait for termites to find and then maybe eat a hidden bait inside a plastic bait station. They just have to pass by it in the soil and they will die a few days later. We use soil injection rods to do this part of the treatment. 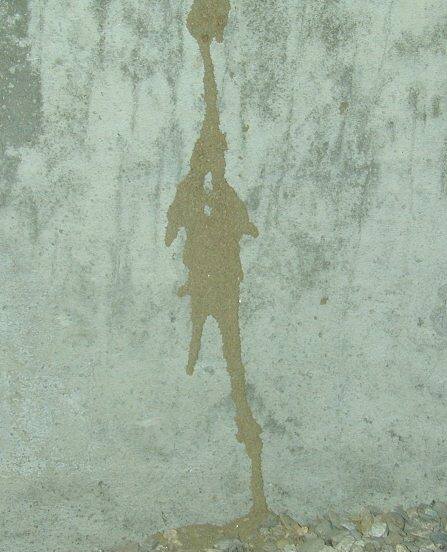 Since the termite workers can’t detect this new liquid treatment, they keep tunneling through it. They then get it on their bodies and end up carrying the treatment back to the main colony. 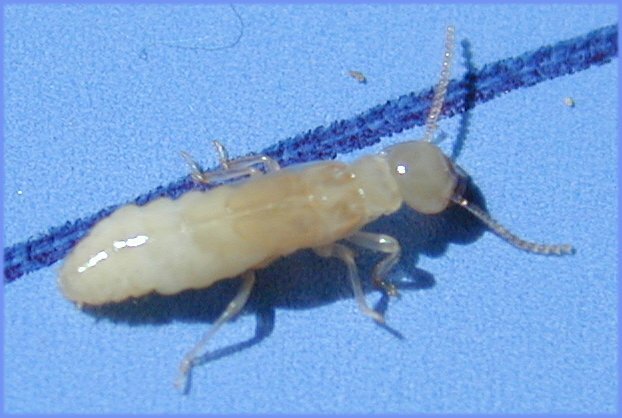 It then spreads from termite to termite by contact and quickly eliminates the entire termite colony. Note: Security Pest Elimination switched to this type of termite elimination treatment back in September of 2000 when it first became available. If properly done, this type of termite treatment, will quickly kill off the termite colony (usually 30 to 60 days) including the queen and protect your house against re-infestation for up to 10 years with a single treatment. In most cases, we no longer need to treat inside your home. The inside treatment if needed, is only applied to the inside area if current termite activity is noted, or another highly susceptible area (i.e. 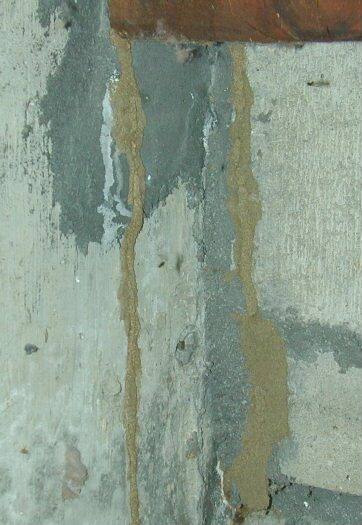 a finished basement wall next to an area found to have termite activity). If an inside area needs to be treated, but has expensive flooring that the customer doesn’t want disturbed, we have specialized equipment to inject a termite treatment into a wall as a foam through a small 1/4 ” hole. Note: Our highly trained termite technicians average over 10 years of experience in dealing with all kinds of structural termite infestations. Termite Treatment – Elimination Guaranteed! 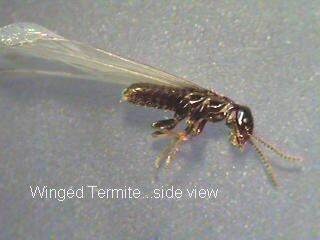 We offer 7 year transferable termite warranties with our termite treatments. If termites re-appear while under warranty, Security Pest Elimination will retreat as needed for FREE and also pay the current owner $200 for their inconvenience. Note: Beware of companies that only offer termite treatments with 1 year warranties, or require annual payments to maintain their termite warranties. It doesn’t take much effort, treatment or expertise to keep termites at bay for just 1 year. The Eastern Subterranean Termites is the variety which we must deal with in the Massachusetts Area. The termite colony lives underground with a king and queen, which can live up to 25 years. The termite colony consists mainly of termite workers, which are responsible for the termite damage done to wood structures, and can number around 500,000. Termite_Soldiers with large orange colored heads and strong jaws (mandibles), protect the termite king, queen and termite workers from predators like carpenter ant workers. There are only a few thousand termite soldiers in a colony, but termite workers can quickly evolve into soldiers when needed for defense. Termite workers travel daily from the wood they are eating to the main termite colony underground by routes known as Mudtubes. Very often, termite activity goes unrecognized until the termite damage to the wood is discovered during a home inspection by a home inspector or a termite inspection by a pest control service company. If termites go unnoticed in your Massachusetts home for a period of years, the cost of the wood repair is usually much greater than the cost of a professional termite treatment to eliminate the termite colony from the structure. Another more dramatic way to discover a major termite infestation is when thousands of termite swarmers come pouring out of your wall in the spring time to mate. Termites usually swarm in the New England area during a 2 month period from April until May. It’s usually on a warm humid day in April or May and can continue for a few weeks until all the termite swarmers have left the ground. These males and females are produced by the termite Queen when the colony reaches maturity. They are gathered up by the termite workers and pushed into the most recently used tunnels being used by the workers from the colony to the food source ( wood). The workers leave the ends of the tunnels and continue eating the wood and the termite swarmers leave the tunnels and head for any light source. If this swarms happens during the night and a light is left on inside, the termite swarmers will mistake the inside of your house for the outside and the swarm will be all over your floor. After they swarm from your walls or your foundation the swarmers will start shedding their wings. They do this so they can mate and then try to get back into the ground to start new termite colonies. If they accomplish this before they dry-out they can live as new Kings and Queens for up to 30 years producing up to 500,000 more workers. Very often though, the termite swarmers will usually all die because they can’t get back into the ground after mating fast enough and they die from dry-out. 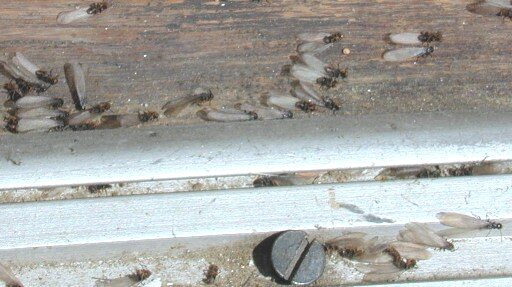 Finding a pile of dead termites or loose wings is a sure sign that termite workers are active somewhere in the structure. Seeing signs of termite swarmers is when a termite pest inspection is definitely needed. What do termite swarmers look like? To the untrained eye, termite swarmers may appear to be small flying ants, but two things will distinguish them from flying ants. The main difference between flying ants and termites is the following. If you look closely, you will notice that the termite body is dark brown or black colored, straight antennae and a one piece body (Termite Swarmer with wings dropped off) (ants have 3 segments to their body). Second, you may notice whitish, clear wings on the floor which have been dropped off by the termite swarmers before mating. 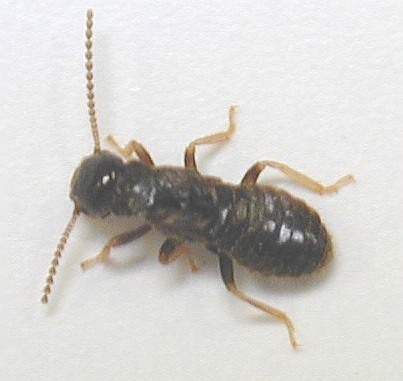 (carpenter ants are much larger & retain their brownish wings and have elbowed antennae). Since termites eat wood from the inside out, wood with visible external signs of termites is usually beyond salvage. Termite workers require a moist environment to survive and must return to the ground regularly to keep from drying out and dying. They maintain their moisture by traveling inside mud tunnels and by sealing the edges of wood they have eaten. Termites do not require moist wood and can eat wood that appears totally dry. Soft woods are preferred such as pine, fir and spruce, but oak flooring has also been eaten. Treating a structure for termite extermination is an entirely different process than treating for other insects such as carpenter ants. Ants travel mostly above ground and effective treatments are usually applied to areas above ground, along with locating and exterminating the colony living in your house. Protective perimeter barriers and residuals are applied to kill off foragers. Treatment for termites differs in that we don’t look for the colony because it can be up to 200 feet away from the affected structure and deep underground somewhere above the water table, below the frost line or under the house. A termite bait station does not seek out termites. Termites actually have to find a bait station and then recruit a large number of colony members to it for it to do any good. They are usually just small plastic cylinders spaced around your home with a cellulose (wood) material inside. This type of termite control is not considered a termite treatment. Termite baiting is usually a 2 part process that should be given a few years to see if it is going to work. Unfortunately, the termites will continue to feed on your house while you’re waiting for results. First, you start with untreated material inside the plastic stations (part 1). If the termites go inside a bait station and the company that installed them notices this, they are supposed to replace the untreated material with a treated material (part 2). Unfortunately, this process usually disturbs the termites enough that they abandon the station. They might come back and eat some bait, or they might never come back to the bait station. If the termites don’t eat any of the treated bait material – no termites are killed. Since termite colonies can replace over 100,000 workers every year, you need to kill a very high number of termites quickly for a termite treatment to do any good. Unfortunately, there is no guarantee that termites heading for your home, or termites already eating your home, will ever find it at all ! Another Problem: If you are selling your house and have paid for a termite baiting system instead of a liquid termite treatment and the buyer’s home inspector opens-up the bait stations and notices that no termites have eaten any treated bait you might have to pay again, but this time for a liquid termite treatment to kill the colony. Several years ago Security Pest Elimination tried termite baiting on a limited basis to check out the current technology. We tried a couple of different types of termite baiting systems. We set-up bait stations around a couple of dozen houses. We monitored them for termite activity for 3 years. After 1 year, 2 houses got termites inside one of the bait stations that were placed around the outside of their homes. We then replaced the untreated food material (phase 1) inside with a treated material (phase 2). The termites then left both stations and didn’t eat any of the treated bait. The second year one of the previous years stations with activity got some termites to eat some of the treated material. The second year 2 other houses got some termites to go into a bait station. We again replaced the material with the treated material. Again, the termites left the stations. By the third year we knew the termite baiting wasn’t working and the termite baiting customers were very unhappy. We found out that we can’t make the termites eat a food source hidden inside a plastic cylinder when they are already quite happily eating your home, even throughout the winter. The termite baiting treatments had a 2 year monitoring plan. We actually checked the stations the 3rd year for free hoping for better results. When results didn’t improve we decided to end the use of termite bait stations as a termite treatment. We called up all the customers that paid for termite baiting and offered them a free liquid injection treatment around their homes with a 5 year extended warranty. They all said yes to the liquid injection treatment and we removed all the bait stations around their homes. We eliminated the termite infestation from all the homes with this single liquid injection treatment and have not had to perform even one re-treatment. Please call to see if we service that area.